Pony E-News: Possible schedule change for a snowy Monday? We're watching the weather closely! Current predictions are that it will begin snowing Monday morning and will grow heavier throughout the day. We will communicate with families by phone and email as soon as we can if there will be a disruption to our regular school day on Monday, Jan. 22. As a precaution, we encourage you to have a plan in place for your family should we need to release students early or cancel school altogether. An addition to Brookview Elementary School in Woodbury could be coming sooner than originally expected. Board members began conversations Friday about adding additional classroom spaces to address new housing development in the area, which is occurring faster than originally planned. Read more. Stillwater Middle School students are putting their math skills to the test in a unique and exciting way. They worked in teams to solve a series of puzzles in order to open a locked box. The Breakout EDU game was made possible through a grant from the Partnership Plan. Read more. Do you have what it takes to teach a Pony?” That’s the question a group of high school students posed to their teachers earlier this week. As part of the January 22 professional development day, teachers listened as a panel of eight 11th and 12th grade students shared their experiences at the high school. Read more. 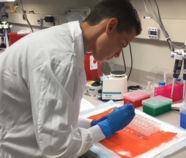 Stillwater Area High School junior Max Stauffer has been recognized nationally for his research on tick-borne pathogens. Stauffer presented the findings during a poster session at the annual meeting for the American Society of Tropical Medicine and Hygiene (ASTMH) in Baltimore, Maryland. Read more. Join us in thanking our paraprofessionals for the outstanding work they do on behalf of our students every day! 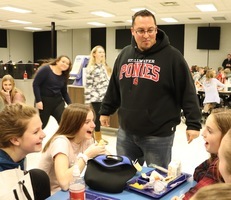 Paras play an important and integral role in our schools whether it’s helping students in the classroom, administering medications, monitoring the cafeteria or guiding kids safely across busy streets. They’re critical to making sure the day runs smoothly and students receive the support and resources they need. The Partnership Awards are annual honors to recognize the many teachers and staff who create such a wonderful learning environment for our students. Teachers and support staff can be nominated by community members, students, parents and colleagues. All current and past employees of Independent School District 834 are eligible for nomination. Each Partnership Award recipient designates a $1,000 grant from The Partnership Plan to the building of his or her choice. Deadline for submissions is Jan. 31, 2018. Make a nomination. Do you know someone who graduated from Stillwater Area High School and went on to make a big difference in the world? If so, please consider nominating him or her for a Distinguished Alumni Award. Each year, we collaborate with The Partnership Plan to honor distinguished grads who have made the community proud. Nominate someone online! The deadline is February 17.